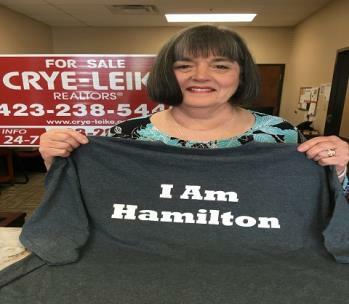 “I am Hamilton” spotlights community volunteer Janice Robertson, a local real estate agent who coordinates the Snack Pack program at East Brainerd Church of Christ. The Snack Pack program provides bags of food for over 1,870 children in 14 schools across the community. National volunteer week is a perfect time to honor Robertson, officials said. “I am Hamilton” spotlights the contributions of alumni, teachers, parents, students, support workers, and community members in providing opportunities for children in the classrooms of Hamilton County Schools. Better opportunities for children today mean a brighter future filled with possibilities for our graduates, their families, and the community. Robertson and her team coordinate over 300 church members and people from the community who come together to pack the blue bags to be given to children before a weekend. The packing takes place in the church’s Family Life Center on the first Wednesday of each month during the school year. The 2018-2019 school year is the fifth year East Brainerd Church of Christ has packed bags of food for children. The church started with 150 bags distributed each week to children, and the number has now grown to 1,870 children receiving bags of food each week. Along the way, the church has helped four other churches start their programs and take over some of the schools served by East Brainerd. The added help by other churches has allowed the program to add children at some of the schools served and two additional schools.